Leftist Media Strike Force - Klayman: Our Leftist Media Strike Force Will Combat This Hate by Media Matters and Soros! Klayman: Our Leftist Media Strike Force Will Combat This Hate by Media Matters and Soros! Media Matters for America, a left-wing news organization funded by ultra-liberal George Soros, is on a crusade to get Fox News host Sean Hannity fired — and they've become very public about their effort. 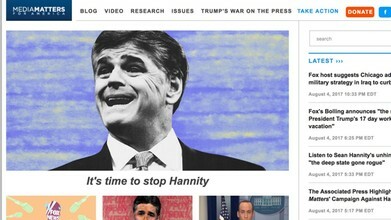 After the Fox host earlier this year insisted on reporting on the story of murdered Democratic National Committee staffer Seth Ruch, Media Matters put pressure on Hannity's advertisers in an effort to oust his from his longtime anchor role at Fox. Media Matters home page on Saturday.